This has been on my list to read for a long, long time! It was very interesting, but not quite what I expected. Goleman teaches us a bit about how the brain works, defines emotional intelligence, talks about its effects and why it is important, and shares stories about some schools using it in their curriculums. What I was hoping for, and what it didn't deliver, was more of a how-to. 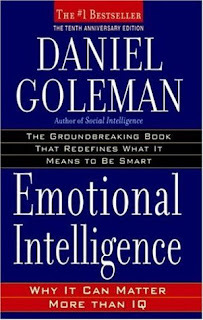 In the section where he defines emotional intelligence, he talks a bit about things like managing one's feelings, feeling empathy, and that sort of thing, but he never actually provides any advice on developing one's emotional intelligence. The most useful part of the book was Emotional Intelligence Applied - real-world scenarios of his principles in action in marriage, business management, and health. He provides interesting information about how emotional intelligence is good for you, your relationships, and your work with examples and statistics. I got a little bored with all the child-related chapters near the end, but it's probably useful for parents. Goleman has written several other books and hopefully I will eventually read some of those. A few of them are a bit to spiritually-focused for me, but I'm particularly interested in one called Social Intelligence, and also Working with Emotional Intelligence. I don't generally read self-help books and in fact get pretty bored with most non-fiction regardless of how much the subject matter interests me. Rather than reading the books, I'd love to just attend a workshop or lecture on these topics, but I suppose I will have to settle for reading.